All the Maxam food chopper parts are made of stainless steel. The high-quality material and chrome finish used by the manufacturer ensure the appliance's durability. There is no bowl for the chopped food. This easy-to-use and most reliable hand food chopper will become the best cooking aid in your kitchen! It will make food preparing both fun and enjoyable! 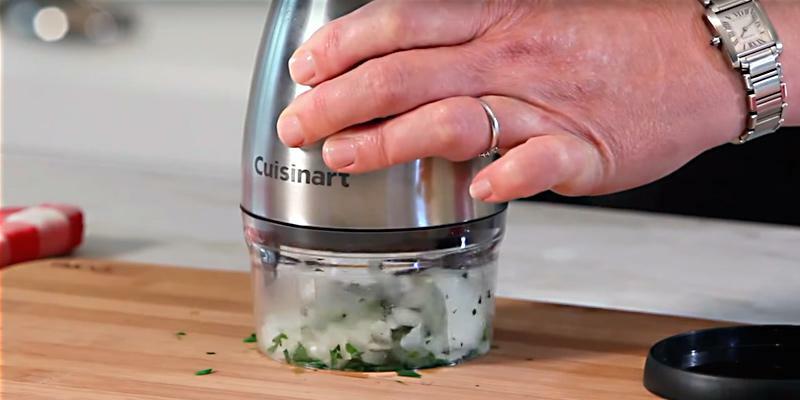 The Cuisinart is a wonderful portable food chopper. The appliance is easy to store and maintain. And, above all, it allows convenient cooking. Chops only small or previously sliced foodstuffs. 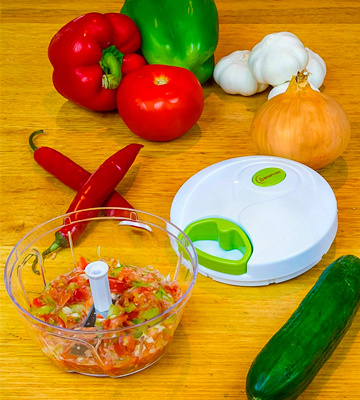 If you need to chop an onion, garlic, carrot, or a bundle of greens quickly and without using a knife and a cutting board, this portable manual food chopper is a must-have! 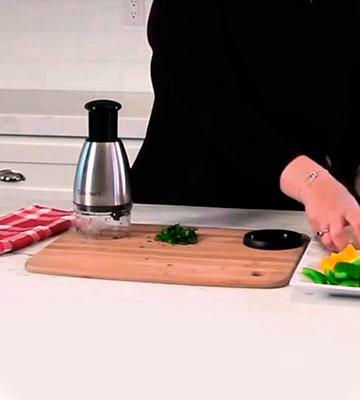 This Chef'n VeggiChop hand food chopper has an easy-to-use chopping mechanism. Its pulling handle in the shape of a ring can be put on the lid for comfortable storage. Fine chopping of hard food may be weary but it is always efficient. Good value for the price! 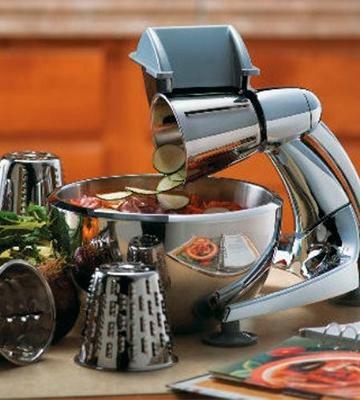 The Chef'n manual food chopper will make fruit and vegetable chopping easier, more neat and tidy, and much safer! The unique mechanism allows controlling the thickness of the cutting with maximum convenience. The more times you pull the handle, the thinner slices you'll get. It might be hard to remove food debris stuck between the ridges. The Brieftons Manual Food Chopper will significantly simplify your kitchen tasks. The device is very compact and doesn't require a lot of storage place. You will also get additional e-books with recipes that will make your home menu more versatile. 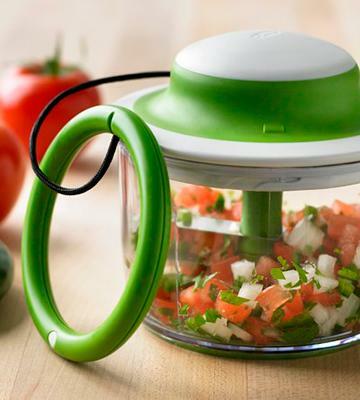 The Kitchen + Home manual food chopper has plenty of attachments for most comfortable cooking. You can whip batter, separate yolks from whites and even squeeze juice! The handle should be properly fixed to prevent its damaging. 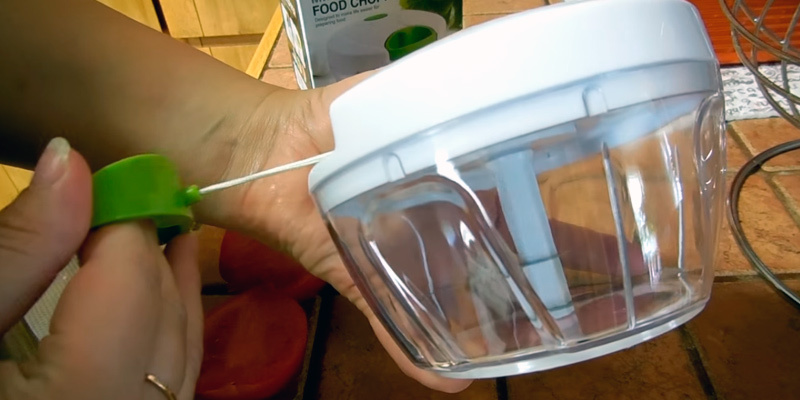 This amazing manual food chopper is a decent alternative to an expensive food processor! This multifunctional device is portable, ergonomic, simple to assemble and easy-to-clean. Among a variety of food choppers available, the Maxam Vegetable Chopper definitely stands out. This model bears a close resemblance to a mechanical meat grinder but instead of a mincing cup (hopper) it comes with replaceable cutting cones. All its parts are made of high-quality stainless steel that is chrome-finished and shatterproof. This ensures the chopper will serve long and won't break easily. Furthermore, unlike cheaper models, this steel doesn't get dull easily and remains sharp for a really long time. Speaking of safety, the manufacturer equipped the Maxam Vegetable Chopper with a protective finger guard to secure users from accidental injures and cuts. Plus, it comes with a special cap for safe storage that can be removed when you need to clean the chopper. The only con of this model is that it doesn't come in a full set. You get a high-quality chopper but you get no bowl for chopped food. 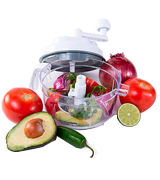 However, we do not count it as a real flaw because the Maxam Vegetable Chopper can be used with any bowl or container you have in your kitchen. 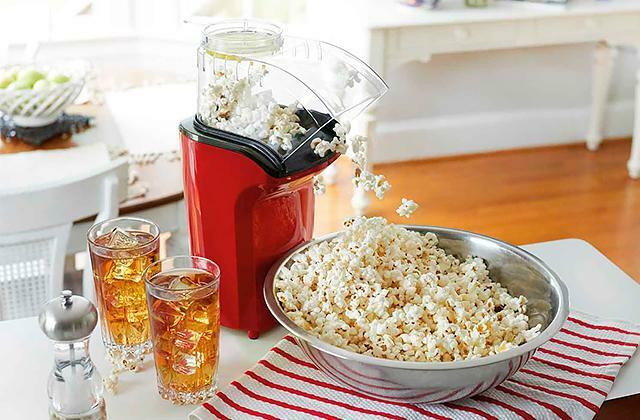 In terms of performance, this hand food chopper is no slouch either. To satisfy customers looking for multi-functional devices, this model comes fitted with 5 cutting cones making it possible to slice just about any food ingredients you have in your kitchen. 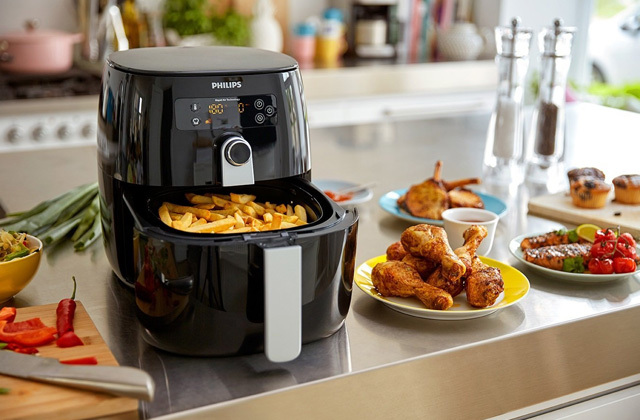 Whether you need to make a salad or crispy French Fries for lunch time, with this chopper it will be easy to do. The Maxam food chopper design gets 10 points out of 10! The device works best with hard veggies and cheese. Owing to a 3-leg suction cup base, it grips with the surface and doesn't tend to slide off it. All parts of this hand food chopper are dishwasher safe. There is no bowl, but you can use it with any you have at your disposal. To conclude, if you're looking for a kitchen tool to cook quick and easy, the Maxam food chopper is the best deal. High-quality and robust, it will let you handle most chopping tasks. The fact that there is no loud engine makes this machine usable at all hours of the day, which can be a bonus some people. The machine is well constructed and feels solid. The bottom part of the machine (the one with the legs) comes off for more convenient storage. 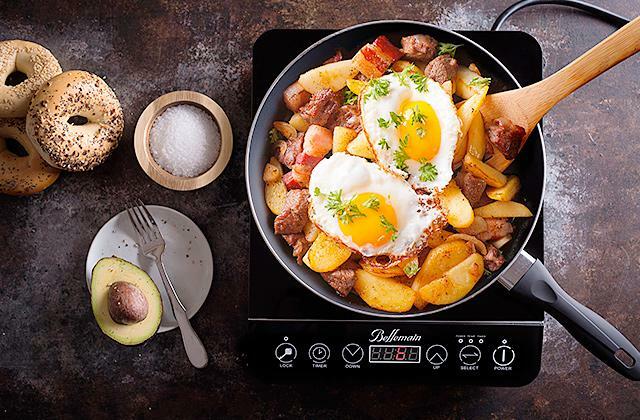 If you're looking for a high-quality, reliable kitchen appliance to help you with cutting and chopping, the Cuisinart CTG-00-SCHP will do the trick. Although this chopper seems rather small, it does a fantastic job chopping, greatly reducing the time for cooking. 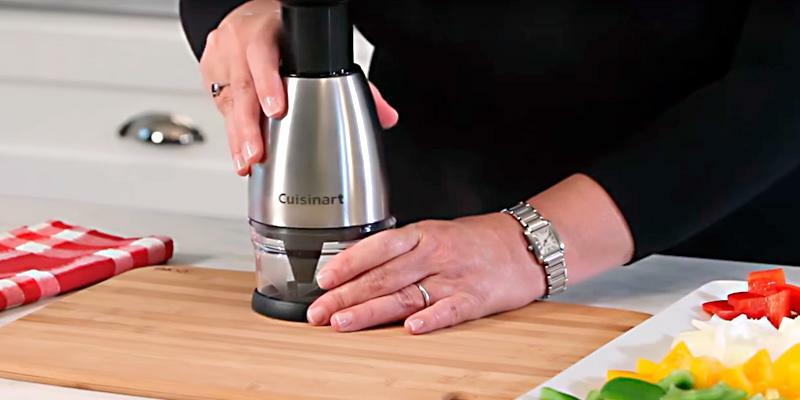 What's special about the Cuisinart CTG-00-SCHP is that it combines the functionality of several tools. 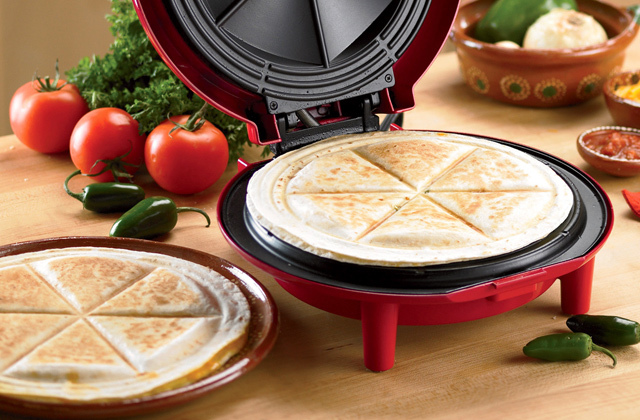 It can help you not only to cut veggies but also grate hard cheese, herbs, garlic and onions. Truth be told, it's a fantastic device for small jobs such as chopping herbs. Once the food is put inside it, you simply need to press the button up and down repeatedly until you get the mixture of the desired consistency. 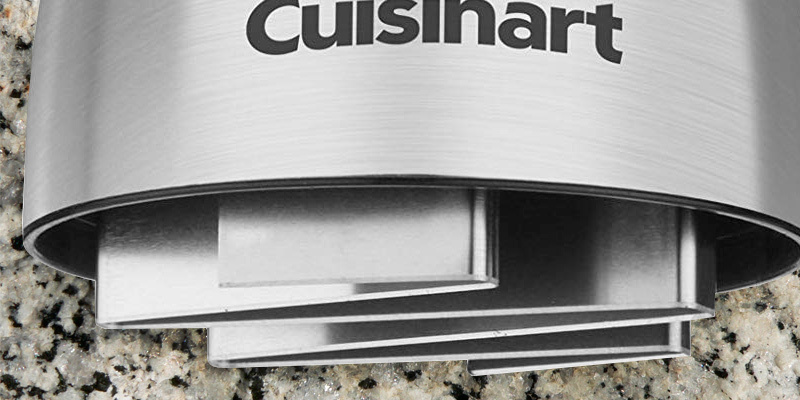 The Cuisinart CTG-00-SCHP is also suitable for chopping nuts, which makes it a highly appealing choice. 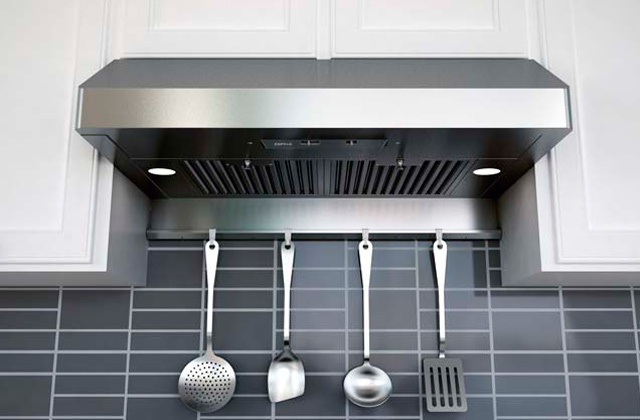 What we should also mention is that due to its small size, the chopper doesn't take a lot of space on your kitchen countertop - this makes it a go-to option for those households where each inch counts. The most peculiar feature about this food chopper is that it allows for chopping, cutting, and slicing food without using a cutting board. Thanks to the cover at the bottom of the chopper, all the food you chop remains in the cup. Such design feature not only makes it much more convenient to use but also eliminates the need to clean the mess after each use, which usually follows preparation and cooking. One other feature to be mentioned is the non-skid base. It keeps the chopper in place preventing it from sliding off the surface. Finally you should be pleased to know that this chopper is dishwasher safe. If you or your family are a fan of salads and you often chop a lot of veggies and fruit, you definitely need to find an alternative to using a knife, even such a good one as a Chef knife. 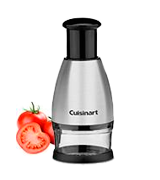 Such an alternative can be the Cuisinart Stainless Steel Food Chopper. 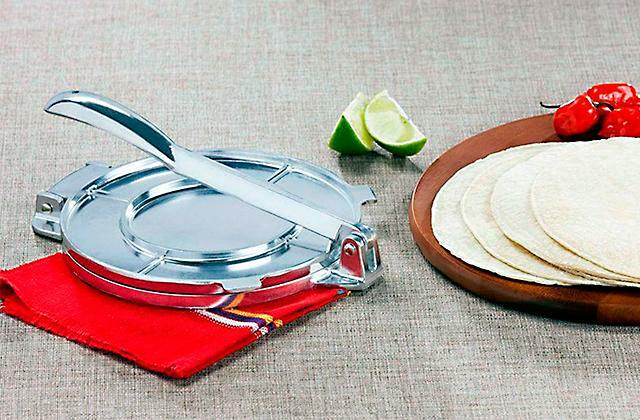 Though fairly small in size, it does a great job of chopping and slicing food. Plus, it looks ultra modern thanks to its stainless steel design. 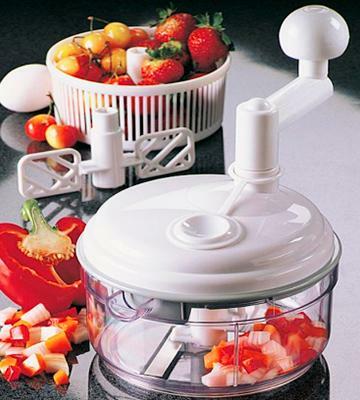 With a food chopper like this, you will soon forget about the hassle related to using simple kitchen knives. It's easier to use than the others I've tried. There's been no muscle pain or fatigue. I love the size, don't mind that if I want a nice chop, an onion may take me 4 loads. Love the blade rotation nice even chopping. Good weight and control. Pull the Cord, Get It Chopped! The Chef’n food chopper is a manual model which works by pulling the cord attached to a ring handgrip. This mechanism is very simple yet effective and allows you to achieve a consistency you need. With the Chef’n food chopper slicing food will be not only easy but also quick. Fitted with high-quality, sharp blades, the chopper can handle both soft and hard food and you can get the mixture you need chopping this food either to fine pieces or to coarse ones. Though the Chef’n food chopper looks very simple, it's very effective and can fit a variety of cooking tasks besides chopping. You can use it for making various sauces such as pesto, guacamole, and, of course, salsa loved by many people worldwide. 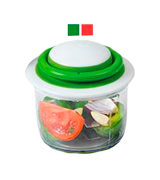 Plus, due to its cute design (transparent and with a bright green lid), your kids will be happy to help you with cooking: it starts only when it's locked and, because it's transparent, it's easy to see what's happening inside, the thing children love most about it. This way, the Chef’n food chopper can help you involve little family members of yours in cooking from the early age. With sharp stainless steel blades, this food chopper can tackle any cutting job perfectly. It can cut even tomatoes and meat delivering finely sized pieces without turning them into a mash. So, despite manual operation, this appliance delivers professional results. You can also use it for pureeing. Just put the fruit your love, close the lid and turn. What we like about this model is that it's possible to take it with you on trips and picnics. Due to its lightweight, plastic design, the chopper is not easy to break and it doesn't add weight to your backpack. To conclude, the Chef’n food chopper can be a real valuable purchase. 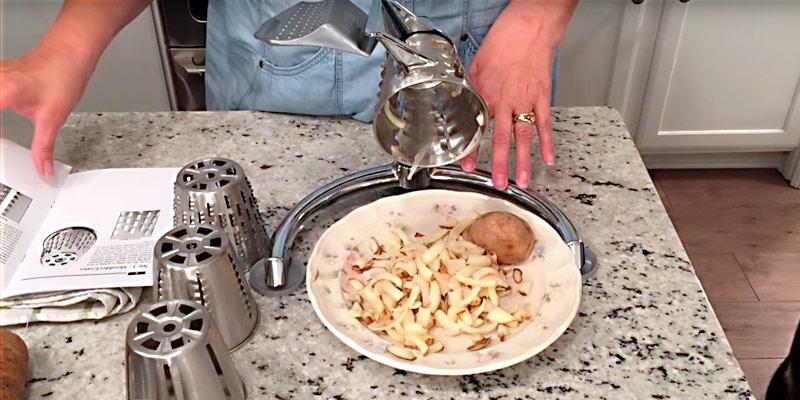 Inexpensive yet high-quality and practical, it will let you get your food chopped to the right size in a span of a few minutes. With a lockable lid, the device is totally safe to use and can handle a great variety of foods both soft and hard including meat, carrot, and nuts. So, if you want to simplify your life and spend less time on kitchen chores, the Chef’n food chopper may be the best choice for you. This is a small device. I would say you could easily chop up one small/medium sized onion with it or half a large sized onion at a time. Tired of spending long hours in the kitchen? With the Brieftons hand-powered food chopper, slicing food will be much easier and quicker. This manual device has an innovative design that allows you to chop and mix vegetables simply by pulling the cord. 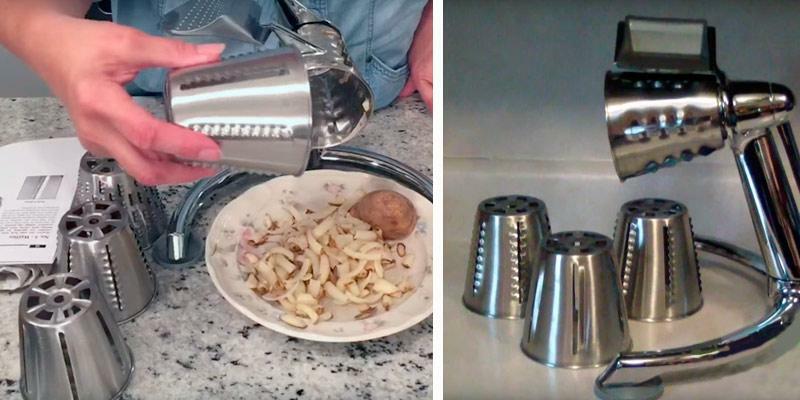 And since it combines the functionality of a blender it allows for chopping nuts as well. 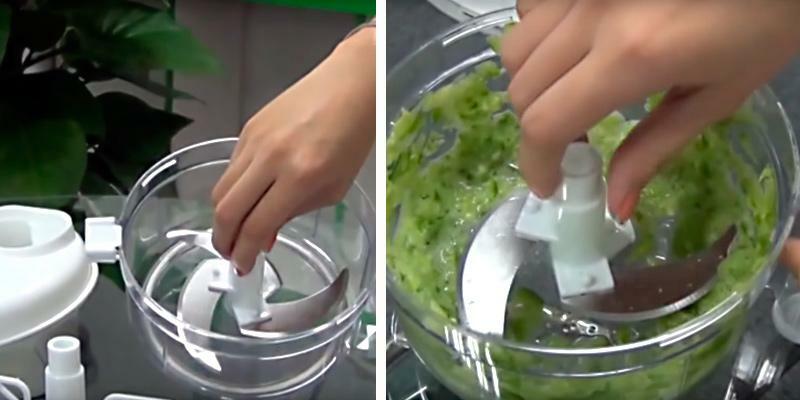 With this blender, chopping food is going to be not only easy but also mess-free. Due to its closed construction, the food won't get outside and your countertop will remain clean. The container offers a decent capacity. Though not big, 24 oz makes 2-3 cups of food, which is enough for most small households. What we find especially attractive about this chopper is that it doesn't tend to produce a lot of noise. It works quietly by simply pulling the cord attached to the handle. Such mechanism is not only convenient in use. It also makes it easy for you to control the thickness of the food. Basically, the more times you pull this handle, the thinner the slices will be. What is handy is that the container is transparent so you can check the size of the pieces without opening the lid. The Brieftons hand-powered food chopper comes with non-skid feet that give it a good grip with the surface. 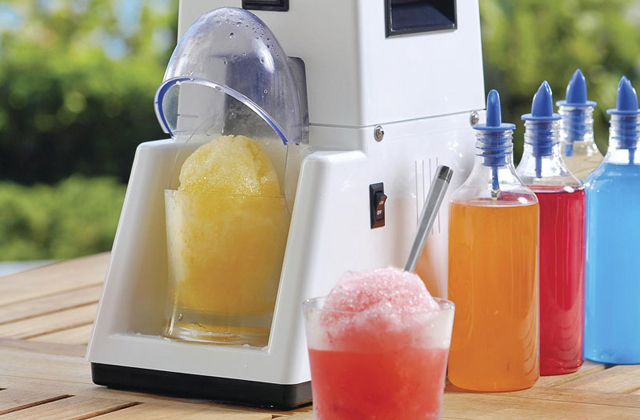 This, in turn, adds to the convenience of use and allows for mixing any type of food ingredients with little worries. One thing which isn't particularly great about this chopper is that due to the ridges in the bowl it might be quite hard to remove food pieces if they get stuck there. Saying that, the fact that you can simply throw it in a dishwasher diminishes this minor drawback. Inside the dishwasher all food debris that you failed to remove by hand will be force-driven by water. Made of high-quality plastic and stainless steel, the chopper doesn't tend to darken over time and will live through many washes. Besides, all of its parts are easily removed, so you'll not have to fiddle with that either. This all makes its maintenance an easy job. As a nice touch, the manufacturer supplies this chopper with 3 additional recipe e-books where you can find plenty of new and interesting recipes to make your home menu more diverse. There you can find recipes from different cuisines and learn to cook the world "favorites". No matter whether you're trying your hand in cooking salsa or making a regular dinner for your family, the Brieftons Manual Food Chopper will help you in the process. It offers excellent performance, requires low maintenance, and it's small and compact in size, making it an attractive choice for almost any household. If you need a versatile appliance combining the functionality of several tools, this model will fit the bill. The Kitchen + Home hand food chopper is a wonderful alternative to an expensive electric food processor. What is the reason to spend a lot of money if you can get the device that performs the same functions at a moderate price? 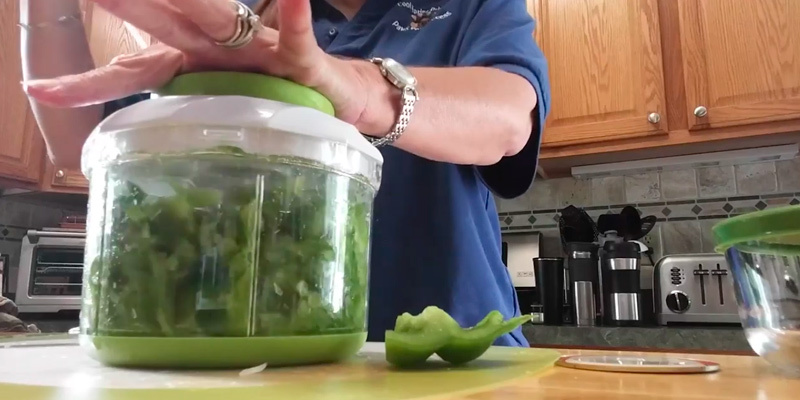 This manual food chopper can do anything you would expect from a food processor. What we like the most is that this unit from Kitchen + Home comes with a very rich set. It has 7 functional attachments. 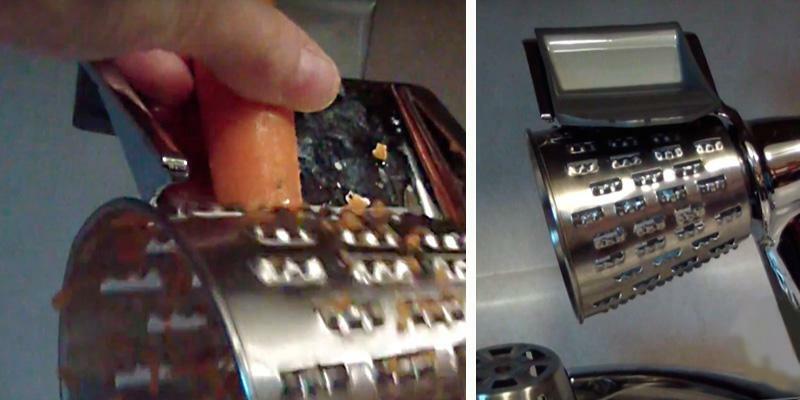 There are 3 inserts: slicer, julienne, and shredder. High-quality stainless steel blades make thin slices that will make any dish look tempting and beautiful. You can also grate veggies to add to salads and soups, and slice fruit. The curved edge chopping blade is super sharp and will let you make purees out of soft and hard food as well as mince meat. A plastic blade is used for whipping batter and eggs. Two other attachments include an egg separator, which is used for the obvious purpose, and a citrus juice extractor. Like we've mentioned earlier, this hand food chopper is a great value for the money. 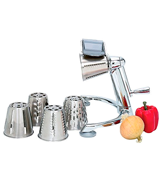 For a modest price it comes with plenty of accessories and can be used for a variety of chopping/mixing/slicing tasks. Regarding the design, this chopper is made of high-quality plastic and features a safety holder to prevent finger cuts. It doesn't need to be powered: the manual operation makes it a handy tool on a variety of occasions. Furthermore, all of its parts are dishwasher safe and can be stored in a container. Speaking of the container, it has a capacity of 32 oz that makes about 4 cups of food. 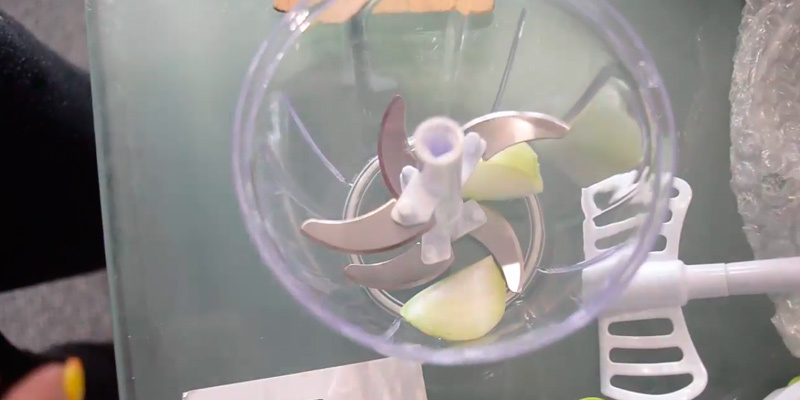 In conclusion, this amazing manual food chopper from Kitchen + Home is a decent alternative to an expensive food processor. It is portable, ergonomic, simple to assemble and easy to clean. 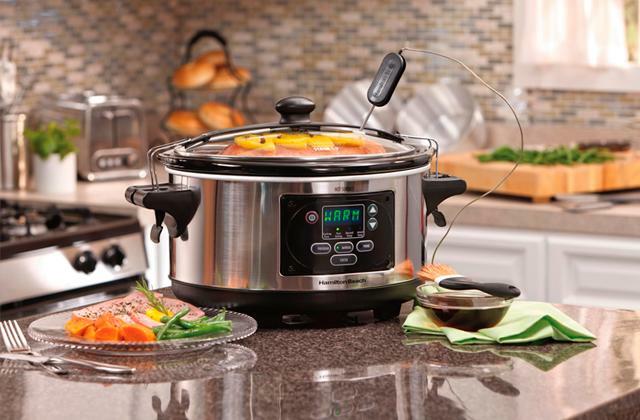 With this device, cooking will become much quicker and more enjoyable. 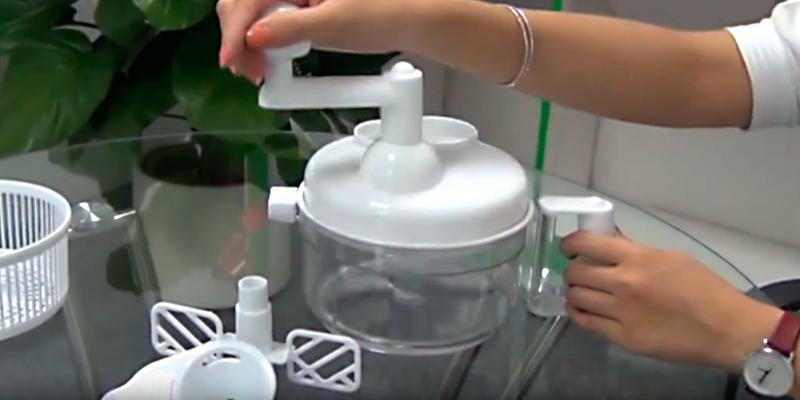 A food chopper may not help you in pureeing or mincing meat, though the given tasks could be easily performed by countertop blenders or hand blenders. What's more, these appliances hold the splashes and sprays inside the cup, hence you won't have to scrub the flooring and walls in your kitchen after use. 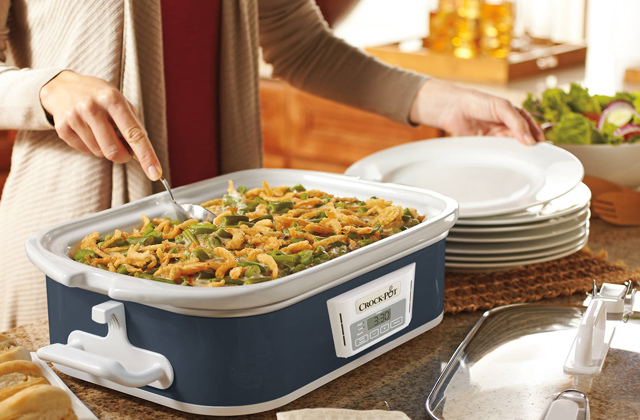 Capacity is great; easily makes a med-lrg bowl of guacamole or salsa ! I was looking for a medium sized manual chopper when I saw this Salsa Maker. The best part about is it you can cut the pieces the size that YOU want. If you want larger chunkier pieces you just do not cut them as long. What Is a Food Chopper? Time is one of the most precious things in today’s hectic world. Luckily, there are devices designed to save your time! It may take too long to slice veggies for a salad, prepare a sauce and do some other slicing, chopping or dicing. Getting a food chopper makes all these things much faster and easier! No more humdrum cooking! Now you can prepare delicious and good-looking dishes quickly. 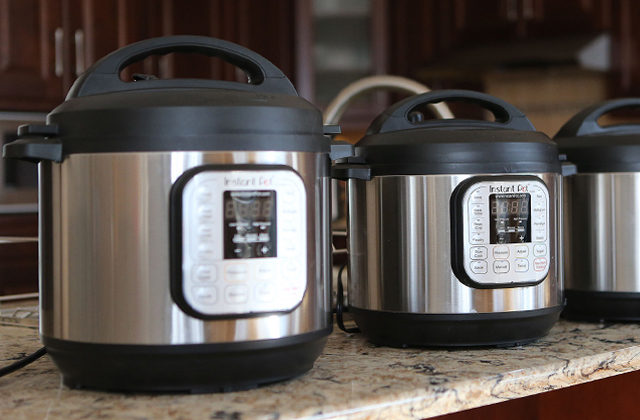 At the same time, electric food processors require more space in your kitchen. Besides, not all of their functions are necessary for an everyday use. If you need an efficient device to simplify cooking, consider buying a hand food chopper! We have selected five best manual food choppers and give you some tips to make the right choice! 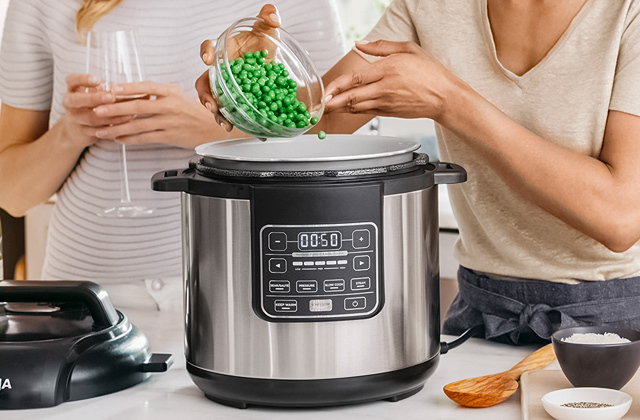 If you cook a lot and need an appliance to help you in the kitchen, please look through our electric food processors and stand mixers which are meant to speed up the cooking process dramatically! The first thing to consider when choosing a manual food chopper is its performance and the extra features that it has to offer. Manufacturers of choppers usually supply their products with a variety of attachments to help you handle various foods. 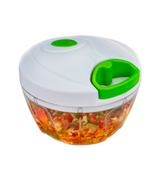 If you are going to cut onions, carrot, herbs and nuts predominantly, we recommend getting a portable hand food chopper with one blade - it will let you chop food with quick hand movement. 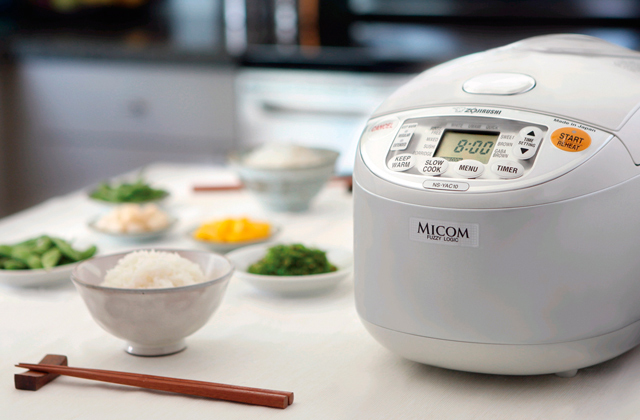 Are you looking for a decent alternative to an expensive electric food processor? Consider purchasing a manual food chopper with multiple attachments, which will let you slice, dice and shred food as small as you need. Some choppers come including a separate container or a bowl, making them a suitable choice for making different sources. There are also choppers that can do mince. If you prefer largely-cut meat pieces in the mince, this type of chopper is perfect for that. Another thing to consider is design. Food choppers come in different sizes, shapes, and designs so you can choose the most appropriate one for the tasks you want it to accomplish. The most common type of a food chopper is the one with a blade and a cord. 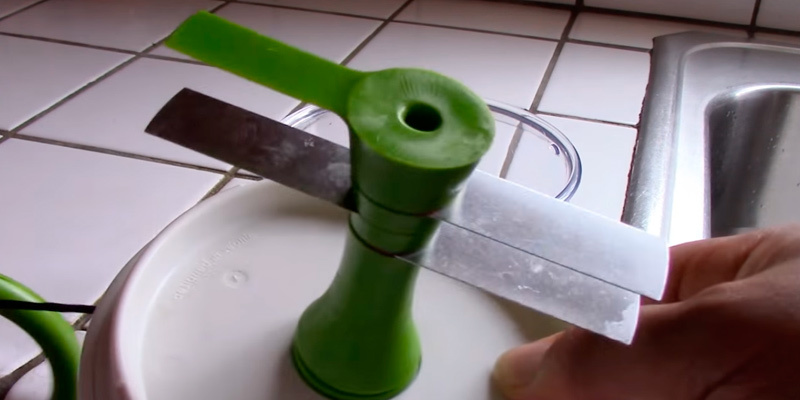 It works by moving the blade inside the bowl while you pull it by cord which comes attached to its handle. The operation principle is simple. The more you pull the cord, the thinner food slices will be. Another type is the one with a plunger handle. Its work is based on the same principle, with the only difference being that instead of pulling a cord you need to push the handle. You can also find food choppers with rotating handles. This type is often supplied with a container and made portable so you can take it on trips and picnics with you. If this is the type you want, make sure to check its bowl capacity. Not all food choppers come with containers though. You can find many manual models that are intended for use only in the kitchen and require separate bowls. The manual food chopper performance and durability depend on the blades and housing materials. Usually, the manufacturers use stainless steel and plastic. Stainless steel items have a stylish look. Besides, they are impact-resistant, which ensures both durability and safety. High-quality stainless steel is both corrosion and rust-resistant. No wonder it is one of the best materials to contact with eats. Chopping blades made of it stay sharp for a long time. 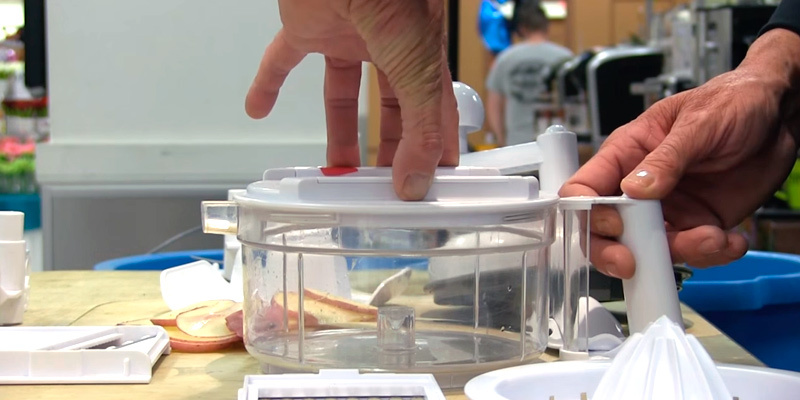 To ensure a hand food chopper durability, manufacturers use fine plastic. This lasting material is both lightweight and easy to maintain. The manufacturers provide various additional features to make their products more convenient. For example, a non-skid bottom surface would add to an ease of use of a massive food chopper. The models that come with a special container/bowl and a lid ensure comfortable storage of the chopped foods. To prevent hurting your hands, choose the model with a finger protector or a safety holder. You should also keep in mind the ease of maintenance. Most of the food choppers are dishwasher safe, which helps save your time. Some devices come with a special cleaning tool. In our review, we showed you five models of different food choppers. They can be suitable for many kinds of foodstuff and cannot only cut and chop but also grind, shred, slice or even juice. Still, some users will not agree that they can replace a full-sized food processor. Even though electric processors are multi-purpose devices that require minimum involvement from your side, there are certain occasions when manual food choppers prove more useful than food processors. About some of which we're going to tell in this section. If space is an issue, buying a food processor might be not worth it. Stuffed with plenty of bulky attachments along with blades and cutting disks, it does eat some space. In comparison, manual food choppers have smaller footprints and are more portable. Though they don't offer as much capacity as food processors, most people find 2-4 cups of mixture plenty enough. Naturally, food choppers have less blades and thus are easier to store. Moreover, due to the smaller size, you can even keep it on your countertop. With smaller dimensions comes a lower price. Since we established that manual food choppers not only have smaller containers but also have fewer attachments, their price tag will be more appealing for those who are on a shoestring budget. Nevertheless, choppers still can significantly simplify your kitchen tasks and allow you to spend less time cutting. So, if you are looking for a more affordable kitchen appliance, manual food chopper will fit you. Another thing is, food processors are less effective at chopping small amounts of food than food choppers. Quite often they simply cannot grab all food in the bowl and miss some bits. This is where a manual food chopper will be more helpful. 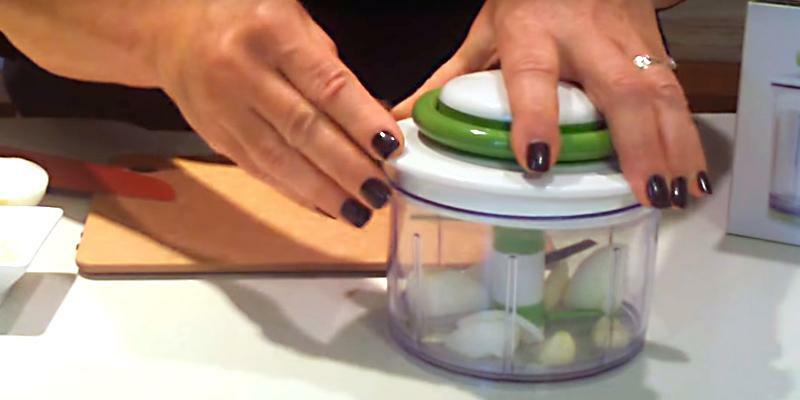 So, if you often have to chop onions, garlic, and herbs, you'll achieve better results with a food chopper. Finally, food choppers require less maintenance than food processors. They contain fewer parts and their blades are less intricate so it's easier to clean them of remnant food. So, if you're thinking whether to buy a manual food chopper or a food processor, consider this information. If you are somewhat limited in space, need a simpler appliance to perform 3-5 functions or look for an affordable alternative to a food processor, a food chopper is exactly what you need. 1. Curtis Carper Kitchen Chopper Reviews, Food and Cooking Guide. 2. 8 Best Food Choppers, Wiki.ezvid. July 2016. 3. 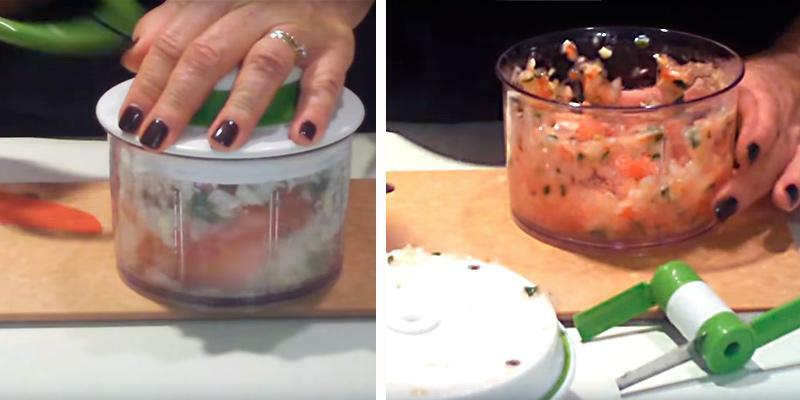 Food Processor vs. Food Chopper, Delishably. June 9, 2015. 4. Yvette Fletcher How to buy the best food processor, Which?